Don't you just love snuggling on the couch in a fuzzy blanket during the winter? What would make it even better? The wafts of a sweet-smelling candle right by you to take you to a warm, happy place. 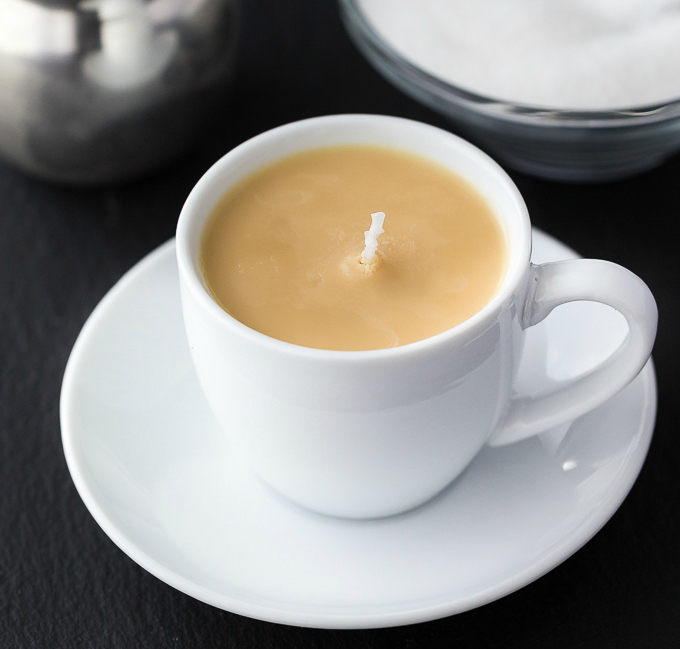 Compliment any room with this caramel latte candle. Step 1: Place a small amount of wax adhesive to the bottom of the wick. Step 2: Place the wick in the center of the teacup. Hold it for a few seconds to stick it in place. Step 3: Fill the teacup (to the brim) with soy wax flakes and then dump them into a separate bowl. Then repeat. You will need two teacups full of the soy wax flakes. Step 4: Put your soy wax flakes in one bowl and place it over a pot of boiling water. Stir occasionally until it completely melts. You should heat the wax until it reaches 160F. Step 5: Remove the bowl from the heat (be careful, the bowl will be HOT!) and stir in drops of caramel liquid dye until you get the color that you want (usually about 6 drops). Step 6: Add 10-15 drops of your desired scent—we're using caramel latte fragrance oil—and stir. Step 7: Pour wax into the teacup and leave it at room temperature, it usually takes an hour to harden. You're all done! Now you have a super cute and sweet-smelling candle that will add style to whatever room you put it in. What's your favorite scent? Let us know in the comment section below!